Ortofon OM Night Club II Single Turntable Cartridge DJParts - All Variety of Parts that DJ Needs. The Ortofon Nightclub II Cartridge builds upon the success of the original Ortofon Nightclub Cartridge. This Ortofon tonearm cartridge's numerous improvements and redesigned cosmetics bolster its status as one of the reigning industry standards for turntable cartridges. 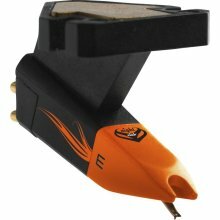 The Night Club II cartridge's improvements are 2-fold: first, the reengineered stylus and cartridge body are tuned to make the most of modern dance music; second, the increased output voltage requires less gain, providing cleaner sound reproduction and less susceptibility to feedback in live environments. Adding to the allure of the Nightclub II cartridge is its redesigned cosmetics, including an orange stylus and detailing on the cartridge body.